Outside My Window... There is a slight breeze and blue skies. I can hear the rustle of the leaves as the wind blows. I am thinking... We have a ladies fellowship tonight at church and I need to prepare the sausage balls I am taking to share. I am thankful for... My family. I am so blessed! From the kitchen... a tea kettle is full of hot water for my tea! Yum! I am wearing... a short sleeved pink plaid shirt with a long black skirt. I am creating... cloth napkins for my family! Yes, I am going to sew them tonight! I am reading... about my camera!! I want to learn to take better photographs. I am hoping... that my daughter takes a long, restful nap today. She wears herself out when she plays! I am hearing... the gentle hum of the dryer. Around the house... it is becoming FALL! Leaves on the ground outside, soup on the menu inside!! One of my favorite things... learning. I love to learn. This week? Sewing napkins! 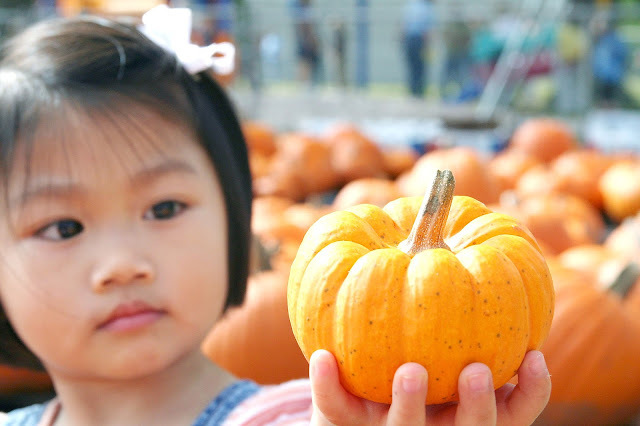 ... a carefully chosen fall pumpkin. 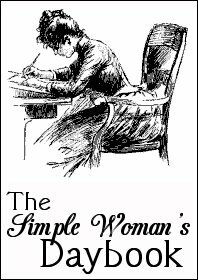 Please visit The Simple Woman to visit more daybooks! You're a very busy woman. I miss those days of being home keeping house. I so enjoy working on the house on my days off. I plan on doing some baking during my days off. You have a terrific week. You are making cloth napkins!?!? You didn't tell me this tonight!!! I'm so excited for you! Let me know how they turn out. I enjoyed reading about your day, much of it I can vouch for because I saw you tonight. I enjoy being around you....you are soooo special! I always love reading these. I love the picture of Elizabeth. Sounds like you are one busy woman. Mrs. U + Blogger = confusion!!! It's GIVEAWAY TIME! And this time it's TEA! !